crucial for the development of smart and responsive biomaterials for biomedical1,2 ..... chemical surface modification using materials such as proteins, silver. Seo et al. 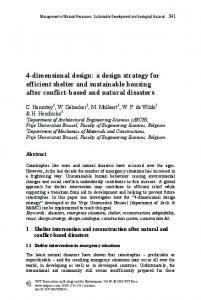 (2002) make further improvements on the dynamic system design ... is used, where the best designer and the best designs are kept always. Piezo clamp. Groove flexure. Pallet. Piezo. Plate mount. Groove plate. Collar. Ball. Flexure. Groove plate. Pallet. Clamp. Actuator. Compliant mechanism. Ball. ANNEX 1 Overview of energy carriers and materials in the STEAP model. 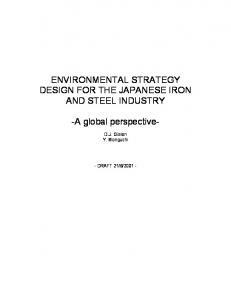 ANNEX ...... approach that is applied in this study combines a number of topics into an .... Corex is a proven technology for producing pig iron from pellets and coal. The. Lithography, Direct Laser Writing, and several single particle placement methods ..... low scanning speed of 3 Âµm/s.90 Stimulated emission depletion (STED),. all parties adopt best practice of design management, innovative designs that incorporate ... set of contractual strategies for improvement of design management. in projects using D/B systems. 5 ..... (Website: http://www.pacebase.com/e-base/). Foster the transfer of new technologies into products for commercial and public benefit .... product stewardship that becomes more integrated, steps linked, and. 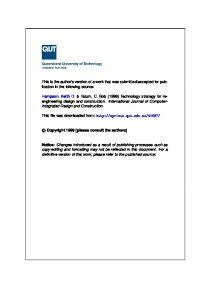 Apr 23, 2012 - Nanomanufacturing systems: opportunities for industrial engineers, IIE Transactions, 44:7, 492-495, DOI: 10.1080/0740817X. ... have started to take center stage. ... high production rate and volume) manufacturing processes. Nanomanufacturing Strategy and System Design for Nanoscale Patterned Magnetic Recording Medium NSF NIRT Grant ECS-0404308 PIs: Dmitri Litvinov, T. Randall Lee, Dieter Weller*, C. Grant Willson**, John C. Wolfe University of Houston, Houston, Texas, 77204 *Seagate Technology, Pittsburgh, Pennsylvania, 15222 **University of Texas at Austin, Austin, Texas, 78712 The long-term goal of this project is to demonstrate ultra-high density magnetic data storage using nanoscale patterned magnetic recording medium, a single-grain-per-bit recording paradigm, where the randomness inherent to conventional polycrystalline magnetic recording medium is eliminated through lithographic patterning and self-assembly methods. The program combines several diverse research efforts to explore the fundamentals of nanomagnetics, recording physics of patterned media, nanoscale self-assembly, and the limits of resists and lithography. The specific objectives are: 1) to develop patterned magnetic recording media design guidelines for "next generation" information storage systems; 2) to develop highly exchange-coupled patterned media materials using combinatorial materials synthesis; 3) to develop manufacturing strategies at the nanometer scale using a combination of Atom/Ion Beam Lithography and Step-and-Flash Imprint Lithography; 4) to demonstrate a prototype of a functional patterned medium at the scale of 25 nm/bit or 1 Terabit/in2; and 5) to extend the technology to the superparamagnetic limit at 3-4 nm/bit using a novel patterning approach based on self-assembled nanomask lithography. Figure 1: (top) Electron micrograph of a patterned medium test sample based on exchange coupled (Co/Pd)10 multilayer stack; (bottom) magnetization curves of continuous and patterned multilayers. barriers to domain wall motion. In addition to serving as a probe of fundamental nanomagnetic concepts, these experiments demonstrate the potential of atom/ion beam lithography patterned medium fabrication and the suitability of the developed magnetic multilayers for ultra-high density patterned recording medium applications. Ultra-Thin Atom/Ion Scattering Masks: We have demonstrated the feasibility of using ultra-thin objects as atom beam lithography scattering masks. Two micrographs shown in Figure 2 demonstrate a nearly perfect replica in silicon dioxide of a 20nm carbon nanotube. This result is highly non-trivial since the stopping range of the 30 keV helium atoms used to print the image is 0.4 µm, which is more than 200 times larger than the nanotube diameter at its center. This ratio is even larger at the edges. Preliminary modeling data indicate that indeed the intensity in the shadow region may drop to below 1 % of that in the areas with direct illumination. Thus, ultra-thin foils can serve as masks in atom beam lithography. Figure 2. Electron micrographs of (top) 20nm carbon nanotube overlaid on top of a silicon stencil mask; (bottom) atom beam lithography print of a 20nm carbon nanotube in silicon dioxide. Nanomagnetic Design: We have developed a 8.0 fh = 3nm fh = 5nm nanomagnetic formalism to describe 7.5 fh = 7nm magnetization switching during the write process 7.0 fh = 9nm in patterned medium recording. This work is 6.5 necessary to design patterned medium system. 6.0 Figure to the right shows the dependence of the 5.5 switching field on head-bit misregistration, one of the critical parameters in a patterned medium -2 0 2 4 6 8 10 12 14 16 recording system. The tolerance to head-bit Misalignment (nm) misregistration defines the lithography precision Figure 5: Dependence of the switching field on required for patterned medium fabrication. writer-bit misregistration. Student learning: Two advanced courses have been developed by the NIRT team related to this research: “Introduction to Design and Fabrication of Nanoscale Materials and Devices” (undergraduate/graduate) and “Ferromagnetic Materials and Devices” (graduate). The cumulative enrollment in the Fall 2004, Spring 2005, and Fall 2006 is 55 including students from Electrical and Computer Engineering, Chemical Engineering, Mechanical Engineering, and Physics departments. References (10 point font)  For further information about this project link to or email to  Dmitri Litvinov and Sakhrat Khizroev, "Perpendicular Magnetic Recording: Playback", Applied Physics Reviews in Journal of Applied Physics, vol. 97, Art. No. 071101, pp. 1-12 (2005). Chunsheng E, Darren Smith, Sakhrat Khizroev, D. Weller, J. Wolfe, D. Litvinov, "Physics of Patterned Magnetic Medium Recording: Design Considerations", Journal of Applied Physics, vol 98, Art. No. 024505, pp. 1-8 (2005). Joon-Seo Park, Andy Nguyen Vo, David Barriet, Young-Seok Shon, T. Randall Lee, "Systematic control of the packing density of self-assembled monolayers using bidentate and tridentate chelating alkanethiols", Langmuir, vol. 21, p. 2902 (2005). Mathilde I. Bethencourt, David Barriet, Nathalie M. Frangi, T. Randall Lee, "Model glycol-terminated surfaces for adhesion resistance", Journal of Adhesion, in press (2005). R.M. Chomko, D. Litvinov, S. Khizroev, “Nanoscale Recording Transducers for Perpendicular Magnetic Recording,” Applied Physics Letters, vol. 87., Art. No. 162-503, pp.1-3 (2005). S. Khizroev, Y. Hijazi, R. Chomko, S. Mukherjee, R. Chantrell, X. Wu, R. Carley, D. Litvinov, “Focused-IonBeam-Fabricated Nanoscale Magnetoresistive Ballistic Sensors,” Applied Physics Letters, vol. 86, Art. No. 042502, pp. 1-3 (2005). John C. Wolfe, “Nanostructures on non-planar substrates by ion beam proximity lithography with plasmapolymerized methylmethacrylate resist,” presented at the 2nd International Conference on Nanoscale Devices and System Integration, April 4-6, 2005, Houston, TX  Darren Smith, Chunsheng E, S. Khizroev, D. Litvinov, “Playback Analysis of Patterned Magnetic Medium Recording,” presented at 2nd Conference on Nanoscale Devices and System Integration, Houston, TX, April 2005; accepted for publication in the Journal of Applied Physics. B. Craver, M. Bhargava, V. Parekh, A. Ruiz, D. Litvinov, P. Ruchhoeft, J. Wolfe, “Atom Beam Lithography: A High-Resolution Massively Parallel Approach for patterned medium fabrication,” presented at 2nd Conference on Nanoscale Devices and System Integration, Houston, TX, April 2005. NSF Nanoscale Science and Engineering Grantees Conference, Dec 12-15, 2005 Grant # : ECS-0404308  D. Litvinov and S. Khizroev, (invited) “Fundamental Challenges Facing Perpendicular Magnetic Recording at Nanoscale Dimensions,” presented at 206th Meeting of the Electrochemical Society, Honolulu, Hawaii, October 2004. 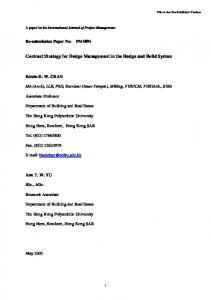 Report "Nanomanufacturing Strategy and System Design for Nanoscale ..."